January 15, 2014  Maria Fabrizio, the creative mind behind the blog 'Wordless News,' invites us into her delightful studio where she's illustrating Morning Edition stories. 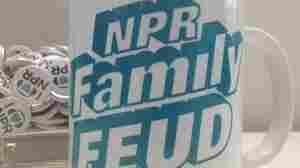 November 25, 2013  It's certainly not unreasonable for listeners to hope that NPR might avoid revealing key plot points or endings when reviewing books and movies. But can we expect spoiler alerts before book or movie reviews based on real life events? And what if those events have already been reported in the news? November 7, 2013  Slugging, urban encounters with deer, biking in 33 degrees below zero temperatures... 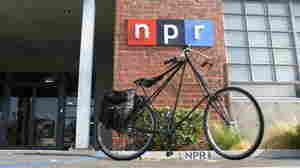 It's all in a day's commute for NPR and public radio staffers. July 31, 2013  This is one account of three NPR political correspondents and their adventure of pie-loving proportion. A trip to discover the great state of Iowa outside of an election year blitzkrieg. July 3, 2013  It's never an easy task to remake a beloved part of American culture, but director Zack Snyder took the challenge with Superman in his new film Man of Steel. 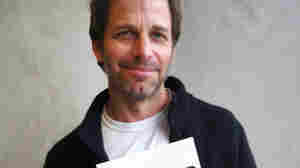 He talked with NPR's Linda Wertheimer on Morning Edition about the Superman mythology, and showed us some superhero love. 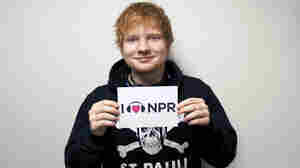 July 1, 2013  As you probably know, we get a lot of stars who love NPR. And sometimes, they're stars who study stars. 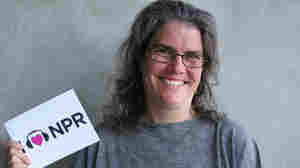 Astronomer Andrea Ghez is "a real hotshot scientist," according to Science Correspondent Joe Palca, who she talked to about new technology for supermassive black holes. 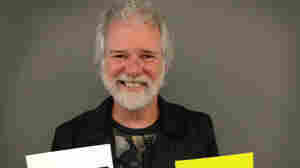 June 28, 2013  After a local performance with The Rolling Stones on their "50 and Counting Tour," keyboardist Chuck Leavell stopped by NPR for an interview with Morning Edition's David Greene. He couldn't resist showing us some love before getting back on the road. 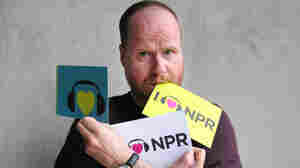 June 8, 2013  Fans of writer/producer/director Joss Whedon don't just kinda like him. They really love him. He also showed us some love after his interview with Morning Edition Host Renee Montagne on his latest film: a modern, black and white movie adaptation of Shakespeare's Much Ado About Nothing. 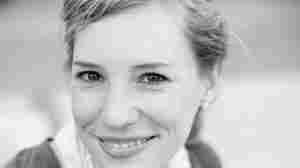 April 23, 2013  The NPR Science desk and Morning Edition have teamed up for a series about one of the world's most celebrated and powerful beans (or berries really). It's Coffee Week, and we're getting in on the fun with a few mug shots. See if you can match these mugs with NPR mugs. 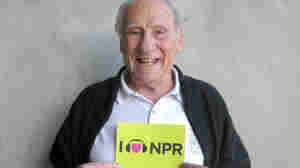 February 28, 2013  Hear comedian Mel Brooks tell NPR Host Renee Montagne about his long career in comedy, which song he's particularly proud of, and the movie he says went a little too far with the vulgar humor. And for the finale, a display of NPR love. 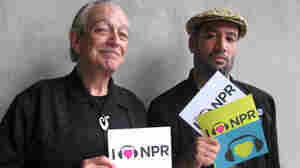 January 31, 2013  Ben Harper and Charlie Musselwhite have been talking about making an album together for 10 years, and now it's out. They came in to talk to NPR host Steve Inskeep for Morning Edition about harmonica playing, song writing, and Muddy Waters. The guys even had a little love duet to show for NPR. January 24, 2013  Aaron Neville spoke with Host Renee Montagne about the new doo-wop album. 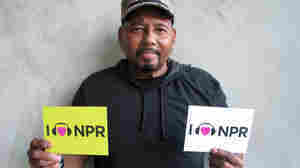 We wish you could hear the unexpected show Neville gave us as he sang to himself in our lobby, but this photo of him loving NPR will have to do. January 16, 2013  British singer-songwriter Ed Sheeran is taking the U.S. and the U.K. by storm with his Grammy-nominated song "The A Team." He talked to Morning Edition host David Greene about couch surfing his way to success, and before leaving, showed that he's singing our tune, with some NPR love.